Multi-tenancy has become an integral component of cloud computing. It refers to the process of a SaaS (Software as a Service) vendor offering a single version of their software to all customers. It differs from a single-tenant hosted solution where the application is located on the server of a vendor and there is a unique code-base for each customer. Although, all users get access to the same fundamental components, the configurations and data for each customer are stored in a separate and secure container. Multi-Tenancy offers a wide range of benefits including reduced expenses, increased scalability, improved performance, and much more. This is what makes Netsweeper the solution of choice by carriers and large enterprise service providers. Cloud computing has revolutionized the scope of information technology, simplifying the lives of people and businesses on a daily basis. Cloud networking offers instant and cost effective enterprise-grade computing resources and allows for straightforward access to IT resources. Resources are easily attainable without having to worry about the complexities of managing the underlying mechanisms. Hybrid cloud computing makes life simpler, making it the obvious choice for businesses. Cloud makes use of the fundamental technology known as multi-tenancy to share IT resources in an affordable and secure manner. Multi-tenancy can be explained best by using an example of a lease agreement laid down by an apartment owner. In an apartment building, tenants share the infrastructure of the building, but have walls and doors that provide privacy from other tenants. Likewise, cloud networking utilizes multi-tenancy to share information technology resources among multiple tenants (businesses and organizations). Multi-tenant SaaS technology consists of three levels of customer integration: the data center layer, infrastructure layer, and application layer. All these features are geared toward developing highly scalable and cost effective SaaS applications. Utilizing hibernate with multi-tenant data includes an application program interface (API) and integration pieces. Hibernate ensures the API is simple and isolated from any underlying integration complexities. There are three types of approaches available to isolate information in multi-tenant systems: separate database, separate schema, and partitioned data (discriminator). Each tenant’s data is stored in a physically separate database instance. Each tenant’s data is stored in a separate schema on a single database instance. All data is stored in a single database schema and the data for each tenant is partitioned by the use of a discriminator or partition value. Since new users get access to the same basic software in a multi-tenant environment, vendors have to deal with far fewer infrastructure implications. It is important to note that shared infrastructure always leads to reduced costs. It does not matter whether your business is big or small, multi-tenancy cloud technology allows you to share infrastructure and operational data center costs. In addition, you do not need to add additional applications and hardware to the data center. Small or medium-sized businesses do not need data centers if they make use of cloud computing multi-tenancy technology. There are often complaints regarding costly maintenance fees in place to keep software updated. A reliable multi-tenancy cloud technology service provider will offer new features and updates when you choose their SaaS subscription. This method eliminates the need to pay costly maintenance fees. 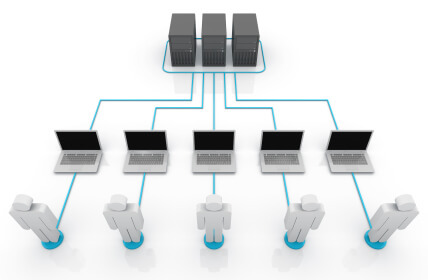 Whenever experts define multi-tenancy, they often discuss hassle free configuration. Private multi-tenant cloud computing vendors offer solutions that are designed to be highly configurable. Businesses can make applications perform however they want without altering the data structure or underlying code. Netsweeper offers a cost effective, innovative, and customized cloud computing solution with multi-tenancy inherent in it’s design. We are deeply committed to offering the best solutions possible that go hand in hand with the exclusive requirements of each client, ensuring the utmost safety and security that is associated with the services of top network providers. A slight glitch can easily make a negative impression amongst all existing customers, making it crucial that vendors invest a considerable amount of time and effort to ensure optimal up-time, performance, and continuity.